Color belts WILL NOT BE REQUIRED to weigh-in. 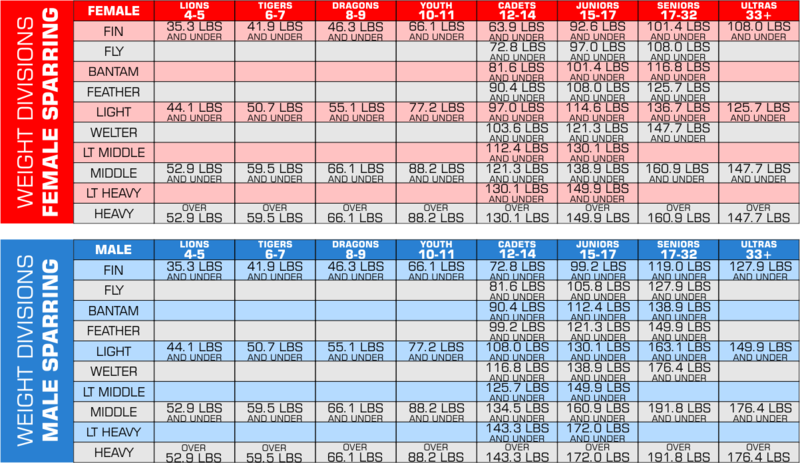 It is important to be accurate when entering weights for your children. If there is a discrepancy and their is an appearance of a mismatch, the organizing committee, including staging volunteers and referees can weigh the competitor. If there is more than 3 pounds out of the weight category, the competitor may be disqualified at the discretion of the referee chairs or the JKIOC. The JKIOC recognizes that schools have different belt systems. We group all competitors based on their rank number, not the belt color. If you have the belt color that corresponds to the division you are registered for, we recommend that you wear that belt color. White or yellow, green, blue, red and black. Color belts will not be using electronic chest guards. The JKIOC reserves the right to modify rounds and duration of the matches. Head kick rules are to minimize injuries that may arrise from excessive contact to the head.